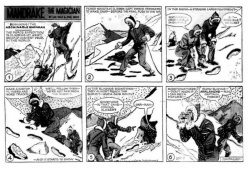 "The Abominable Snowman" is the 81th Mandrake Sunday story. The story was written by Lee Falk and drawn by Phil Davis. Mandrake is on an expedition with Captain Pierce, trying to find the abominable snowman. In a cave atop of the mountain Mandrake stumble into the home of the old greece gods. Capt. Pierce, famed mountain climber. Odin, a Norse god, mentioned only. Thor, a Norse god, mentioned only. Loki, a Norse god, mentioned only. The story title is taken from the strip of November 15 and 22, 1959 (Next Week: "Abominable Snowman" & Beginning: The Abominable Snowman). The Greek and Norse gods came originally from a planet that moves about a green sun, far away our solar system. At Earth Olympus and Valhalla was their winter resorts. This page was last edited on 4 November 2018, at 18:56.